BEIJING. Welcome to Beijing, the capital of China! Hotel rooms are available for a mid-afternoon check-in. BEIJING–ULAANBAATAR, MONGOLIA. Today, fly to Ulaanbaatar, capital of Mongolia. After some time in the hotel, enjoy a city tour that includes Sukhbaatar Square and the NATIONAL HISTORY MUSEUM with a rich collection of exhibits covering the history and people of Mongolia. 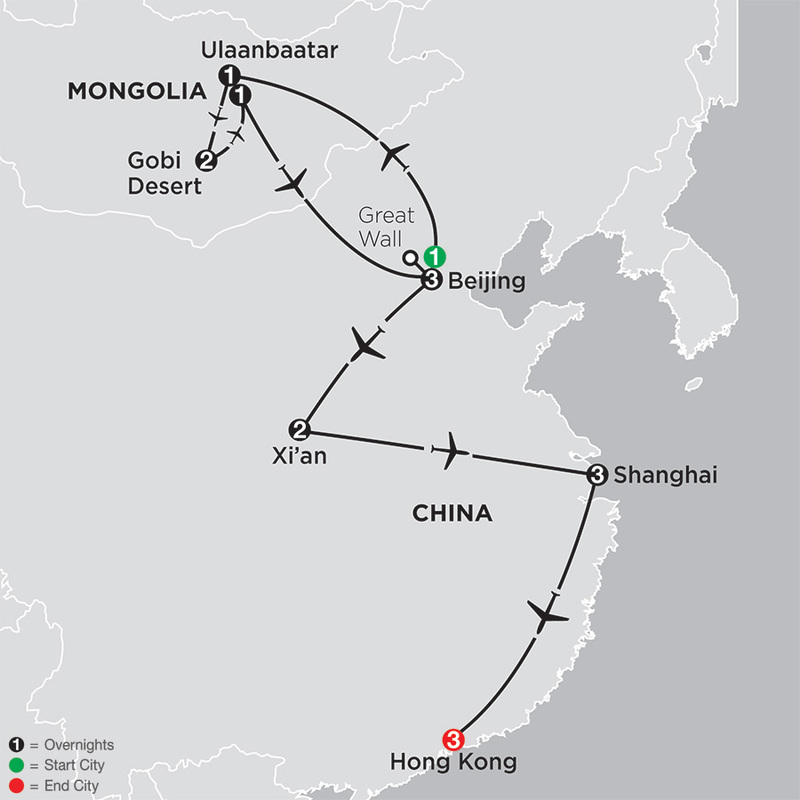 ULAANBAATAR–BEIJING. Today, return to Beijing and enjoy the rest of the day at leisure. BEIJING–XI’AN. Today, fly to Xi’an, the former ancient capital. The remainder of the day is at your leisure. XI’AN–SHANGHAI. This morning, take a WALKING TOUR through the lively Muslim Quarter to explore the Islamic food markets before flying to Shanghai, China’s largest city and center of trade. SHANGHAI. Explore Shanghai at leisure. You may opt to join an optional excursion to the historic water town of Wuzhen, renowned for its Old World charm and picturesque setting. Tonight, join your traveling companions for dinner at your hotel. SHANGHAI-HONG KONG. After breakfast this morning, transfer to the airport for your flight to Hong Kong, Asia’s vibrant commercial capital. HONG KONG. Enjoy free time for independent exploration. HONG KONG. Your vacation ends with breakfast this morning. "China is a fantastic place, and Jerry is excited to share with you over 5,000 years of history, invite you to experience the rich and lively culture, and enjoy his country's unique and natural scenery."